I wrote this book out of my love for both dogs and vintage photography. 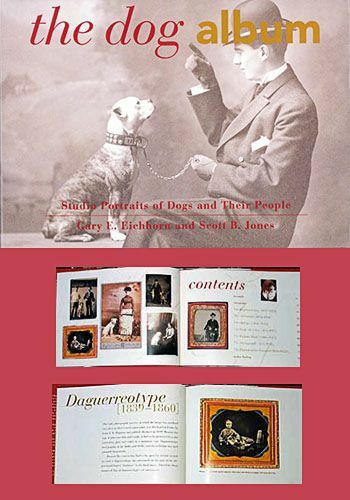 It explores examples of dog and human photography in all the vintage photographic formats including Daguerreotypes, Ambrotypes, Tintypes, Carte-de-Visite, Cabinet Cards, Stereographs and the Real-Photo Postcard. Images are from 1840 through 1900. "In Praise of The Dog Album"
"In this era of specialization, it is most refreshing to be exposed to a book which stimulates interest in multiple, seemingly unrelated subjects. Such a book is The Dog Album, authored by Scott B. Jones and Gary E. Eichhorn. First of all, the book presents a brief but fascinating, especially for the novice, overview of the history of photography. It also provides some interesting background pertaining to the development of modern canine breeds. But most of all, it reflects a profound, sincere love of dogs, and an illuminating historical manifestation of the relationship of dogs and their owners. Certainly, these latter two qualities give The Dog Album its lasting value. I believe the astute and sensitive reader will be drawn to this book looking both forwards and backwards. Backwards, as one cannot help but relate to the mutual love and respect between owner and dog reflected in these wonderful photos. And forwards, as we are better able to understand our current relationship to a favorite dog in an historical context. In conclusion, The Dog Album is not a book one buys, reads a single time, and places on the shelf to gather dust. It is a book one will return to over and over again, to help remember past friends (i.e., dogs) and to more fully appreciate current friends (i.e., dogs)." For visitors to my web site, I am able to sell you a copy of my book inscribed to you or a friend. The purchase price is $15.00 for this full-color, 80 page, hard-bound book with dust jacket plus $2.00 media rate shipping/handling for a total of $17.00. I accept personal check, PayPal, and money order. I will ship anywhere in the continental U.S. for the above price. Other shipping methods and destinations can be arranged. To start the process, please email me so I can get your shipping details, inscription instructions, and we can arrange for payment. Please use the contact page of this web site and I will answer promptly.